I keep track of way too much, and this is one of the rules of thumb that I’ve built up over the years when I’m shopping around for laundry detergent. It’s no secret that a lot of these laundry detergent companies like to make their sales complicated, so I focus on the sale – coupon price per load and if there’s anything else that’s gravy. Also the prices seem to rotate between retailers, so when one place doesn’t have a sale on your preferred brand, another nearby store will have it for sale. One big thing to watch out for is that the normal prices of larger bottles is always lower per load, but during sales the prices of the smaller bottles seem to drop a lot more than the bulk sized bottles. Good Sale Price : $0.16 / load. These sales are pretty frequent. Really Good Sale Price : $0.08 / load. This only happens a few times a year and usually won’t repeat at the same retailer. Nationally, a small fraction of households report incomes of $1 million or greater per year. But at a rate of about 3 out of 1000 households (0.28%), it is more common than you might think. There might a secret millionaire earner in your contact list. While there are only 424,870 of these $1m+ households, out of a total of 149,853,100 in the country. They earn a very large share of the nations income, racking in over 13% of total income. Income share of total income by state earned by households with $1m+ reported income to the IRS. The list of bottom states for high earners is unsurprising with West Virginia topping that list at a rate of 7 out of 10,000. It’s not exactly a bad thing to have a low portion of ultra high earners in your state. Having a low percentage implies that there is probably a larger amount of income equity in the local economy. But since each state is part of the larger US, having a lower fraction may also imply that certain states are less desirable or economically productive compared to others. Table by State and Percentage of Tax returns that are of households >$1 million in ajusted gross income. % of Total Income is a percentage that these households earned of all the income earned in that state in 2016. Stores plan on you not redeeming store points/dollars/rewards that they offer. So don’t let them trick you when shopping this Black Friday and Holiday season with deals that sound better than they actually are. Every store seems to have it’s own loyalty program that has a version of points, dollars, or rewards where you pay up front for a deal and they give you back the points for your next purchase. Retailers love to do this, because they get your money up front instead of offering a more traditional discount promotion where you get the savings instantly. Breakage: Is the percentage of points earned by customers that are never redeemed. According to the Customer Insight Group 30% of retailer points is a fairly normal number for points to go unredeemed. One way to think about it is that stores plan to never have to pay out for a large portion of the points they give out. They could offer out points with the ‘value’ of $10 but only have to plan on paying out $7. The points will expire quickly. They need to be spent in large amounts. Numerous restrictions on what can be purchased. When you look at the value that the store tells you, think about how likely you are to actually spend it. Also remember if the store values the points at 70% of face value–or even less–you probably should too. They’re going bankrupt so uh this is a little risky. This is one of the more obvious rip offs, but I’m sure that there are a few of you out there could make this deal work if you happen to live next to the last Sears or Kmart with the lights still on. Their terms bring up a lot of great examples of how retailers abuse point systems. Because the retailers own the system of points, they can issue as many as they want. If they happen to over-estimate the breakage rate–meaning they made it too easy to redeem the deals– they can simply devalue their points or create new policies to increase the breakage rate. You see this a lot in programs that reduce the amount of time you have to use the points, increase restrictions, or increase redemption minimums. Points can be worth it, but beware. There are a lot of programs out there that are worth it, but it 100% depends on your personal habits. If it’s a store you go to frequently the loyalty programs are great ways to save and shop more. But you need to watch out the offers to stores that you rarely frequent, because those are the most likely to not pay off. Is Imperfect Produce Worth it? 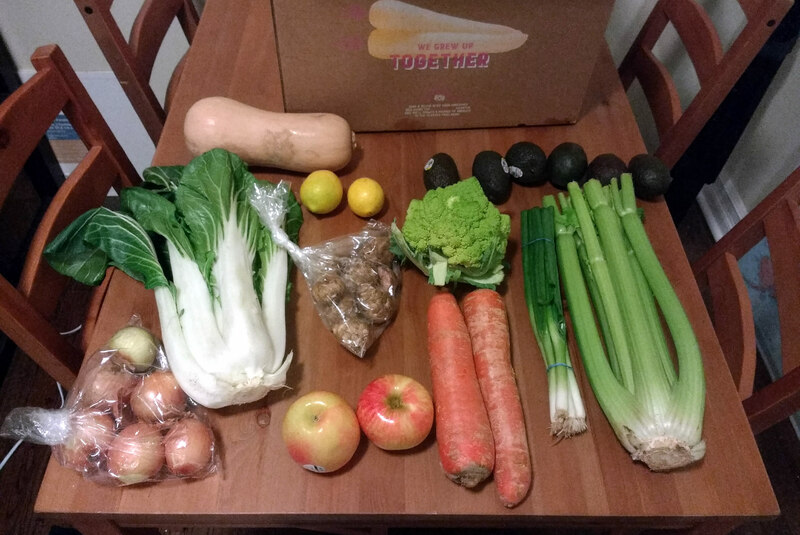 I’ve been using Imperfect Produce which is a vegetable and fruit delivery service for the past few months. Imperfect Produce aims to reduce food waste by delivering ugly and surplus fruits and vegetables to your door. I liked the mission statement, but after a few months I felt like most of the food I was getting was labeled ‘surplus’ and prices seemed to be less competitive. Delivery to delivery, I would often buy basics like carrots and onions that were always labeled ‘surplus,’ but if they’re available all the time are they really surplus? One of the boxes most things look pretty normal. So I broke out my kitchen scale, and I tracked 4 deliveries (2 months worth!). I compared the amount that Imperfect Produce sent me and priced out the equivalent from my local grocer. Everything was compared against a direct replacement as best I could match. 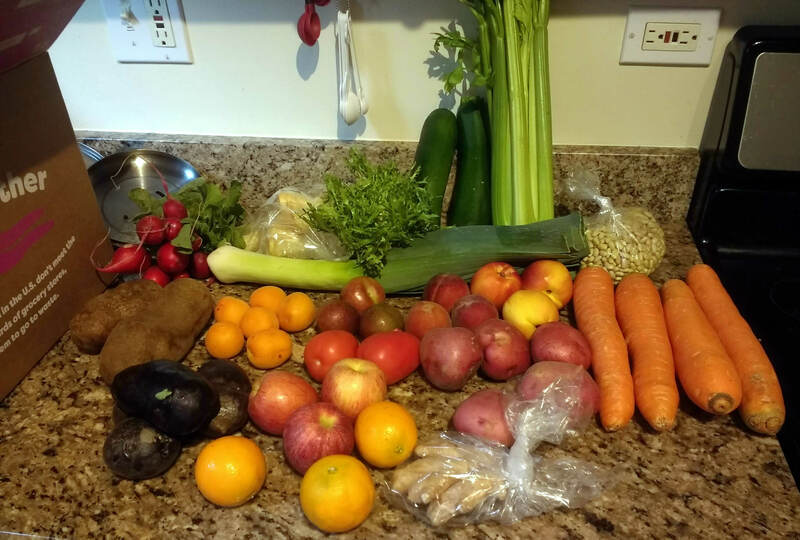 To keep it fair, I also included the Box Fee ($3) and Delivery Fee ($5) that Imperfect Produce charges. As you can see, Imperfect Produce has cost more than the grocery store on all of my boxes. If you subtract out the box and delivery charge the prices of the actual produce and fruits are cheaper, but once you include the total cost Imperfect Produce really isn’t a deal. The actual produce usually looks pretty comparable to what is at the grocery store. Some of the items (espeically fruit) are often smaller than at the store, but really the most obvious things are like the carrots are almost always shaped like giant turnips and the onions tend to be either gigantic or tiny. Don’t use this to save money. If you are looking to get your vegetables delivered this is totally a viable option that doesn’t cost much more than the store. But keep in mind, you will generally end up paying more for the convenience of the having the box delivered. Selection varies week to week, so I do like using the boxes to try out different fruits and vegetables. On top of that you’ll be helping out to reduce food waste, although I’m not sure how much of those savings are offset by the delivery and non-reusable delivery box.